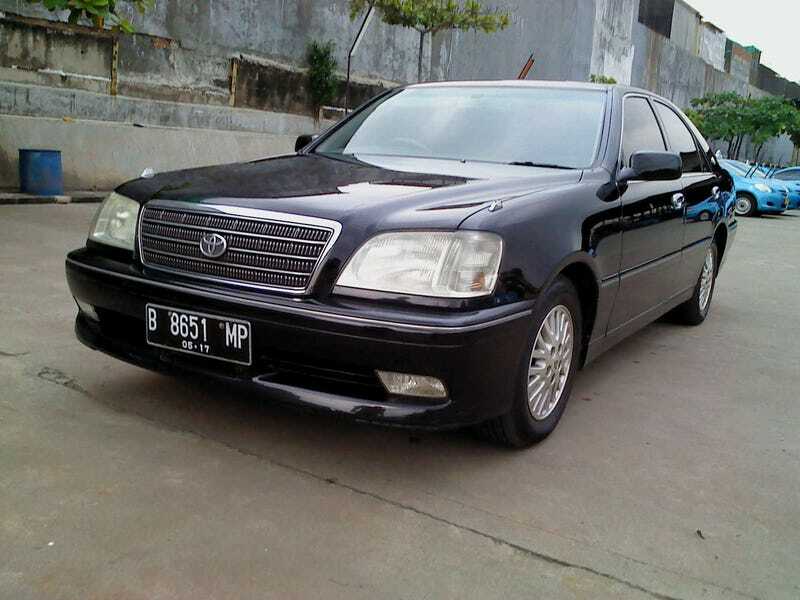 Buy today, this one is a bit older one, a 2002 Toyota Crown. Or i should say, Mercedes-Benz W140 Japanese Cousin. A Little bit of back story first. Today, i went to a local, ex-Taxi car auction here in Indonesia. In here the Taxis that has been in service for more than 10 years are sold by the taxi company, simply because they already got the new one. And i found this crown sitting there, with a reserve price of 7.5k . This Crown was a part of the Indonesian Luxury Taxis called the "Silver Bird". The Silver Bird Taxis is always featured the sedans with the most comfortable ride on the market. These days the Silver birds is a W212 Mercedes-Benz, but in the olden days, it was this car. And well, it looks surprisingly nice for a car that has been used as a Taxi. Just look at those seats. They looks great! Plus, this one comes with a 2JZ-GE Engine, shared with the Toyota Supra. Yes. This one has no turbo tough, and only makes 220hp. And that's enough to pull the car from 0-60 in 8 seconds. But i think this engine has some potential. I mean, let's look back to the body. It's so understated. Strap a turbo in the engine bay and you can get an Ultimate Sleeper! *Well, not really. A tuned Toyota Century would be an Ultimate Sleeper. Anyway, handling wise, it's still like a Crown. It's so smooth and comfortable, but it feels heavy and you can feel quite a lot of body roll. Just imagine driving a Lincoln Town Car, and you get the point. Even the oddysey has better handling than this thing. I think i'll stiffen the suspension a bit if i bought this thing. And now i'm thinking to buy this thing and sell my CLS, since nobody i saw at the auction has the balls to buy that thing, i hope when i came back there tomorrow, the car still up for grabs. The CLS500 like mine usually priced at sowhere arround 70k, so i can use the remaining 62.5k for restoring my Grandpa's 190SL. So it's an ex-taxi, has done 235k kms, and has a body roll amount like a Ship, but very quite and comfortable and powered by a freshly rebuilt 2JZ. 85 Million IDR (or about 7,500 USD). NP?